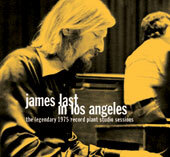 James Last was, in 1975, one of the most popular recording artists everywhere in the world except the United States. Even though James Last records came out almost at a rate of one per month at the time, it's likely that most Americans listening to music in the 1970s didn’t even know that he existed. As far as the States were concerned, James Last was a surprisingly well kept secret. Born Hans Last on April 17, 1929, in Bremen, Germany, James Last, or Hansi as he likes to be called, became enamored, of all things, of the double bass and joined the Radio Bremen Dance Orchestra in 1946. Later on, he formed his own jazz sextet with his two brothers, joined the NWDR Orchestra, and began writing arrangements for some of Germany's most popular musicians, such as Freddy Quinn, Caterina Valente and Helmut Zacharias. This helped to launch Last’s own recording career for the German Polydor label in the early 1960s. Initially, he started covering a variety of easy listening styles, including a Tijuana Brass variation that was oddly dubbed "James Last and the American Patrol" for its US release. Then in 1965 Last hit upon adapting the German musical tradition of stringing songs together in lengthy medleys to such then-in discotheque effects as party people sounds, laughter, talking and hand-clapping. It all turned into "Non Stop Dancing" and became an enormously successful series. Millions of these records sold throughout the world and Last cranked out one after another of these quite literally for decades after. By the time of "Well Kept Secret" in 1975, Last had already waxed 16 "Non Stop Dancing" albums (there's about that many more since then), five "Beach Party" albums and three each of his polka parties, sing alongs ("Sing Mit") and "updated" classics. All of this doesn't even include the "A gogo" albums, concept albums (e.g. "Hair") and countless compilations that were available everywhere except in the United States. Inexplicably, Last found worldwide success, particularly in England, Canada, Japan and even Russia. But for some reason, he'd never reached American ears. He'd decided that to connect with Americans required recording in the United States. A simple enough plan, to be sure. Polydor's man in America, Michael von Winterfeldt, suggested that the German music phenomenon hook up with Wes Farrell (1939–1996), a proven hit maker and the musical brains behind the unbelievably successful Partridge Family phenomenon that swept the country several years before. In addition to co-writing many of the Partridge Family hits, including the main theme, "Come On Get Happy", Farrell had also been credited with co-writing such super hits as "Hang On Sloopy", "Come On Down To My Boat" as well as hits for Van Morrison, the Shirelles, Jay & The Americans, Dion and many others. Centered in Los Angeles with a most impressive résumé and an entire repertory company at his command, Farrell presented himself as the perfect passport to American audiences that James Last required. According to Michael von Winterfeldt, James and Wes immediately "clicked" and the work was a joy. James Last provided the basic arrangements and Wes Farrell and Larry Muhoberac added their own touches. The result is unquestionably the most un-Last album of James Last's entire career if not, coincidentally, among his very best. It's unapologetically electric, combining urban fusion of the period with orchestral touches that wouldn’t be out of place on a film soundtrack, something Deodato found huge success at several years before with his hit, "Also Sprach Zarathustra (2001)". Deodato wielded great influence on musicians and arrangers during this period, particularly James Last, who was "totally crazy" for that new sound Deodato created. James Last wanted that kind of sound for his American record and put Farrell in charge of making it happen. Farrell upped the jazz quotient considerably by gathering some of the best talent in Los Angeles, including star turns by Tom Scott and Ernie Watts and foundation work by former Elvis pianist Larry Muhoberac, Crusaders (and Steely Dan) guitarist Larry Carlton, L.A. Express bassist Max Bennett and former Derek and the Dominos drummer, Jim Gordon (and co-writer of "Layla"). James, Wes and Larry conducted the multi-track sessions, with Hansi taking special care of arranging and conducting the strings. Jubilation – Paul Anka's 1972 gospel hit contains one of the most wicked charts ever written. The roof-raising groove comes from British composer and "Jubilation" co-writer Johnny Harris and no doubt would have greatly appealed to the German Maestro. Here, Last lets the piano lead the tune and redresses Harris's orchestral break and horn outro into something that considerably juices up the old James Last sound. Paul Anka was, incidentally, one of the songwriters Farrell kept on the Partridge Family payroll ("One Night Stand"). Summertime – This version of the Gershwin classic seems more Baretta than Porgy and Bess, with Muhoberac, Carlton and Gordon laying the foundation that Dave Grusin, Lee Ritenour and Harvey Mason provided for the TV show. Tom Scott, who scored and played on many a Baretta episode, takes the fiery flute solo heard here and Ernie Watts counterpoints with an appropriately sultry sax solo toward the end. It's easy to hear why Watts has always been Hollywood's go-to man for romantic sax. "Summertime" is said to be one of Maestro Last's favorite songs, and he's often performed and recorded it, though more in the traditional James Last style than heard here. An edited version of "Summertime" was issued on 45 as an "A" side in Europe (Polydor POSP 45) and as a "B" side to "Love For Sale" in the United States (Polydor PD15108). I Can't Move No Mountains – From the first Blood, Sweat & Tears album after founder (sic) David Clayton Thomas left the group, "New Blood" (1972), this song featured a jazzier sound, no doubt prompted by the jazz musicians in the band at the time, which lent itself well to the cover it gets here. The solos are by Larry Muhoberac on synthesizer and Larry Carlton on guitar. Love For Sale – Had Cole Porter lived through the disco age, he would have no doubt appreciated this take on one of the greatest tunes of temporary companionship ever written. The strings, the horns and Larry Muhoberac's vibrant electric piano make this a classic that could have been equally at home in any blaxploitation film of the period or, more appropriately, a European dance club. While James Last has performed Cole Porter's classic many times, it never got near as funky as this. The "Love For Sale" single went to Top 80 in the United States. Bolero ’75 – There have been quite a few attempts to rock the classics, or in James Last's case, bring the "classics up to date". No doubt inspired by the success of Deodato's "Also Sprach Zarathustra (2001)" (1973), James Last here reconsiders Maurice Ravel's famed 1928 one-movement ballet, "Bolero". Another excellent arrangement carries this performance with Larry Muhoberac and Larry Carlton again taking solo honors. While Last's take here pre-dates Walter Murphy's "A Fifth of Beethoven" hit by one year, "Bolero" was also amp-ed up equally successfully in the same year by Lalo Schifrin and would receive its widest hearing, in its traditional form, courtesy of Henry Mancini, in the 1979 film, "10". Slaughter on 10th Avenue – Richard Rodgers’s jazz-age classic gets an electric reading here that suggests the way CTI Records jazzed the classics at the time (CTI was, of course, home to Deodato during his "2001" hit heyday). CTI owner Creed Taylor, who had overseen productions of "Slaughter" for Jimmy Smith and Lalo Schifrin a decade before, probably would have considered the song too anachronistic by the mid 70s. However, electrified takes of the song suddenly became fashionable and popular with recent covers by Mick Ronson and Larry Fast. The remarkable arrangement heard here slows things down considerably and blends the somewhat jarring sections together seamlessly. Larry Carlton's wailing guitar carries the tune and James Last works his magic with a simply sumptuous arrangement for strings. Question – This 1970 Moody Blues hit posed a question that still seemed worth asking in 1975 (America finally pulled the last of its troops out of Vietnam during the same year this album was recorded). There is also a semi-spiritual quality to Justin Hayward's lyric that would very likely have appealed to keyboardist Larry Muhoberac, who went on to work extensively in the Contemporary Christian Music field. It is Muhoberac who commands the up-tempo portion of the melody (the question) with his left hand on acoustic piano and his right hand playing electric. Then, reversing the slow-fast-slow progression of the suite-like "Slaughter" before, "Question" slows the tempo down for a choir-like group of vocalists for the reasoning portion of the song before ending with Muhoberac’s perfectly symbolic dueling pianos. Theme from "Prisoner of Second Avenue" – Immediately following the huge successes of "The Sting" and "The Way We Were", anything penned by Marvin Hamlisch would figure to be a hit. But neither the 1975 film of this Neil Simon play nor Hamlisch's score for the film found much of an audience. This prototypical piece of soundtrack disco is carried by Muhoberac's siren-like Moog synthesizer and lifted by yet another of James Last's heavenly string arrangements in the middle. "Well Kept Secret" earned its title when the album was issued in the summer of 1975 to very little fanfare and barely any notice. The album was presented at a New York press conference, "hidden" in a linen bag to underscore the "secret" within. A few critics regarded the experiment positively, but as James Last was occupied with a heavy schedule of commitments in Germany, very little publicity or promotion of the album ensued. Longtime fans in Europe, Japan and Russia were indifferent to this very different James Last record and probably didn't know what to make of a jazzed out James Last. Americans, who the record was made for in the first place, either never knew about it or simply passed on it altogether. Over the years, the now hard-to-find record has grown in stature to become a cult hit and, finally, a DJ favorite. It's considered a classic among vinyl vultures and bloggers throughout the world, particularly among those who profess no interest whatsoever in the musical world of James Last. For his part, Sir James considers this record to be among the best he's ever made. Despite the record's lack of success in the States, the German maestro returned to America five years later to try his hand again, waxing the equally exquisite "Seduction". The album's title song, the theme to the film, "American Gigolo", finally scored James Last the American hit he deserved all along. The secret was out at last. Douglas Payne has written extensively about jazz and is a renowned historian and aficionado of the international jazz scene. He produced compilations (Ennio Morricone, Roy Budd, Lalo Schifrin), and researched complete discographies of artists (Lalo Schifrin, Oliver Nelson, Gabor Szabo, Gary McFarland) and labels (CTI, Groove Merchant, Skye, Tappan Zee). More at www.dougpayne.com.